Took a mate from work for a run yesterday morning into some flooded freshwater not to far out of town. After all the rain I figured it might be a good time to get swamp Barra in the runoff. We took his car and my kayaks and headed off about 5am. But all the spots we looked at just didn't feel right. Too much water is still running in a lot of the systems. Most of the places we looked at were running hard and filthy. 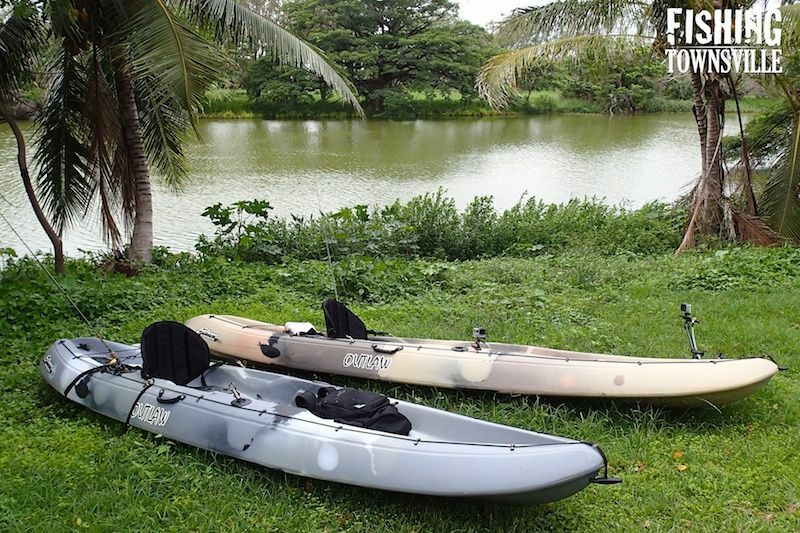 Not to say that you won't catch a Barra in that type of water, but I didn't like the look of it for putting the kayaks in. Maybe next weekend. So its good to have a backup plan! And my backup is a sent of ponds I know usually contain some good Tarpon at this time of year. So that where we ended up! It was probably about 6.30am or so by the time we had sussed out other spots and got the kayaks in the water. On arrival we did see the Tarpon rising in the ponds, but it was a lot quieter that I am use to here. But it didn't take too many casts to discover the fish were there and still willing to play! The video below tells the story well. Over the next 2 hours we caught about a dozen fish between us. The action wasn't thick, but it was consistent. 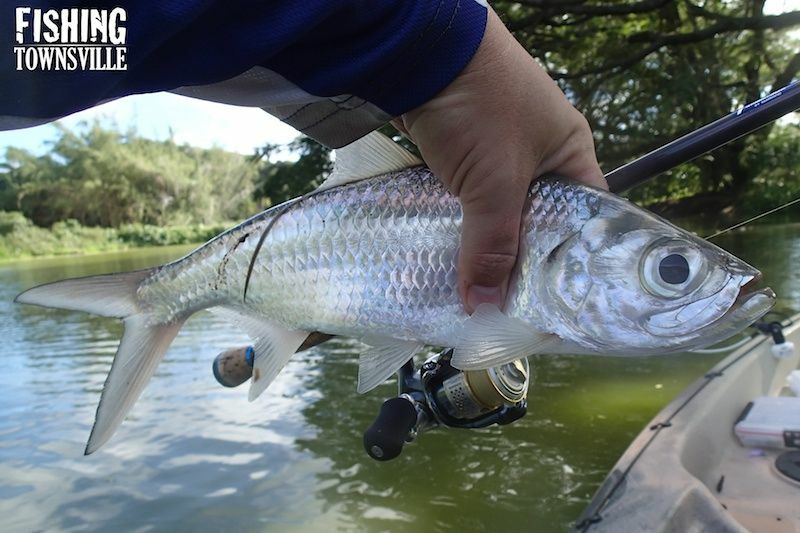 All fish were solid Tarpon, as this spot is well known for. Tarpon are no good on the table, too many bones! But their hard hit, strong runs and airborne acrobatics makes them an excellent sport fish. All fish caught were released to fight another day, but if you do happen to hook one that won't release they also make excellent troll baits for Spanish Mackerel. I fished mainly with a very small 65mm Squidgy Wriggler on my Stella 1000fe combo. 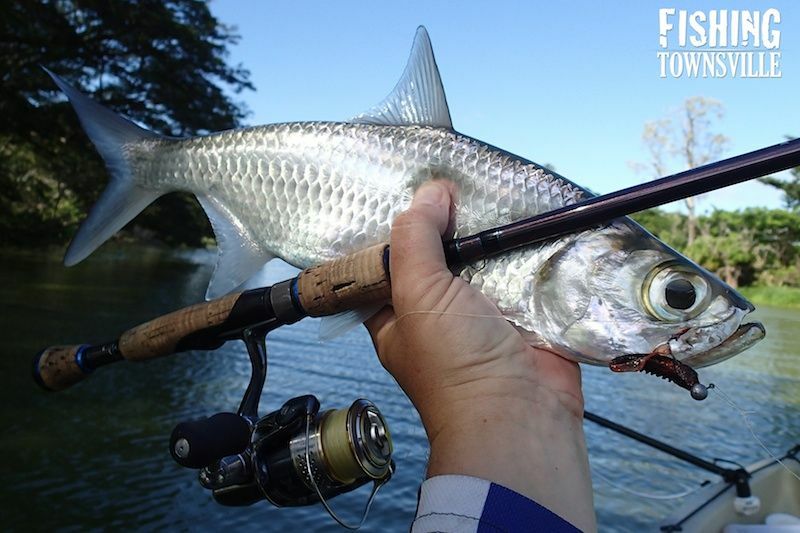 I have found that the Tarpon like a steady but quick retrieve of the plastic. No twitching of the lure is needed with these fish, just give the lure a good cast out and just wind it back. The tail of the Squidgy Wriggler does all the work. I have found dark coloured wrigglers to be the best, and black with an orange tail did it trick yesterday, but I don't think this colour is available any more. 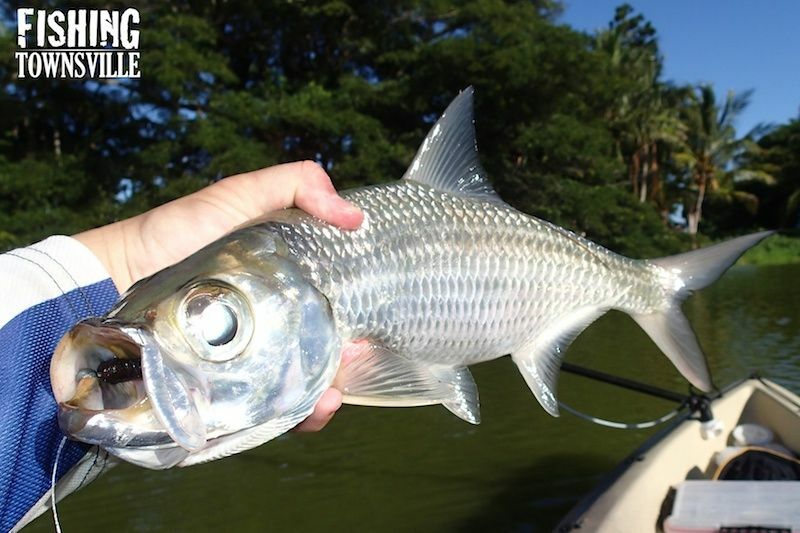 Keep the lure high in the water, just under the surface, as these fish are top water feeders. If you see a rise from a fish, put the lure out just past it and bring in to the area where the rise was, it will likely result in a strike. I also found trolling the Squidgy behind the Kayak incredibly successful. Maybe the paddling added as an extra attractant to the fish? By about 9.30am the fishing started to slow. We were still getting the odd one, but it was hot and getting uncomfortable in yak. So we decided to pack up and head home early. 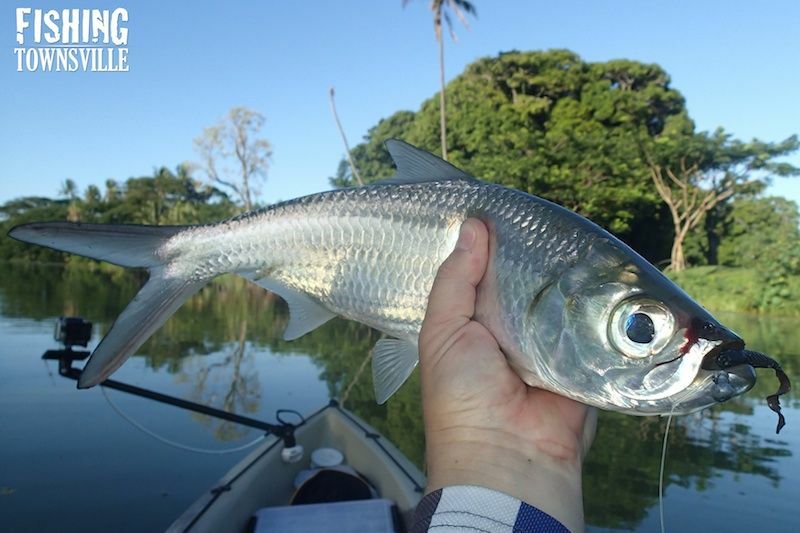 Hopefully by next weekend the flood waters have settled down a bit and the Barra are a better option. Until then I hope you enjoy the video.